It's not only the free market that is being globalized, but illegal markets as well: transnational crime expert Robinson sounds the alarm in this well-researched and genuinely chilling treatise. Veteran author Robinson (The Laundrymen, etc.) pursues a provocative thesis: where the general public has perceived the influence of traditional crime syndicates as waning, disparate developments--primarily the end of the Cold War and banking's growing reliance on computers--have made it possible for discrete criminal entities to merge, much like legitimate corporations do. Robinson begins by recounting how ""Lucky"" Luciano used decentralized business techniques to create La Cosa Nostra in the 1930s; this, the author argues, allowed American organized crime to flourish through the early 1960s, with only sporadic law enforcement victories for years thereafter. 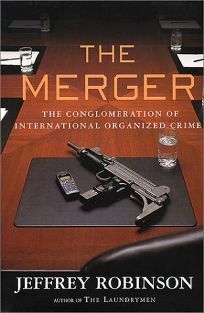 Then Robinson plunges into a sordid history of global crime, identifying key players and the labyrinthine attempts by international law enforcement to play ""catch-up."" Chapters detail the nefarious activities of the Russian ""Mafiya,"" Colombian and Mexican drug cartels, Asian Triads, Japanese Yakuza, Nigerian confidence rings, Hell's Angels, rogue factions of the St. Regis Mohawk tribe and the surviving, leaner and meaner Cosa Nostra (and its Italian relatives). He presents a wealth of evidence that these groups have found ways to accommodate one another in numerous activities worldwide--in identity theft, credit card fraud, smuggling, bribery and counterfeiting, all of which are underwritten by enormous drug profits. More importantly, he explains, the cartels have been able to refine their money laundering, tax evasion and offshore banking crimes. All the while, Robinson provides an exciting and unsettling glimpse of our future as a wired and globalized paradise for thieves. (July) FYI: For more on the Triads, see review above of Martin Booth's The Dragon Syndicates; for more on the Russian Mafiya, see Robert I Friedman's Red Mafiya (Forecasts, May 8).